Australia's Chief Scientist was there. An astrophysicist and string theorist were also there. But little Jacinta stole the show on Monday night's Q&A -- first with her question, and then with an answer to Tony Jones' question. We'll get to Jacinta's question later. Tony Jones gave the panellists a break during the program to tell the audience he'd met Jacinta before the show. "I know you can recite Pi to quite a lot of decimals," Jones said. "Can you just give us, like, a dozen?" "3.141592653589793238462643383279502," said Jacinta, stopping to catch a breath. And then she continued: "8841971". 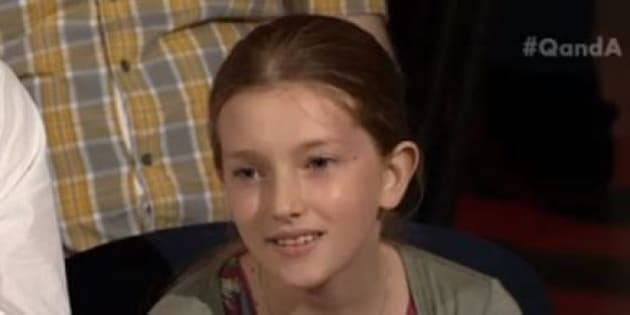 And while the questions preceding the young girl's ranged from climate change and gravitational waves to CSIRO job cuts, Jacinta's showcased the simple curiosity of the young mind. "How do baby sea turtles know how to come back to the same beach they are born on?" You want to know the answer immediately, don't you? Here it is. Marine ecologist and TV host Emma Johnston answered the question. She was one of the three women sitting on the panel on Monday night. While the female panellists outweighed the male panellists on the science special, it over represented women in the industry, with the issue of gender inequality and lack of women holding senior science positions a prevalent part of Monday night's debate. "I am only one of 17% of professors in Australia who are women," said Johnston. "That's something that hasn't changed since the 1960s and, indeed, some people think we're going backwards." "We need to make faster change and also have role models," said Johnston. "I think the thing to hold on to is how much you enjoy the actual research and that structured enquiry and finding data and working things out because that's what will get you through some of the tougher times while we change the structure and the culture." Jacinta, we hope you were listening.